At the Donna Karan New York Spring 2013 runway show, makeup artist Charlotte Tilbury crafted an “unexpected, and a little twisted” pink eye look. I'm attracted to "ugly makeup" and this was so unsightly I had to put to test a real world version of it. Having been described as conjunctivitis and zombie apocolypse who wouldn't want to try it? To re-create the exact runway makeup: MAC lip liner in Magenta was used to trace over the upper and lower lashline. 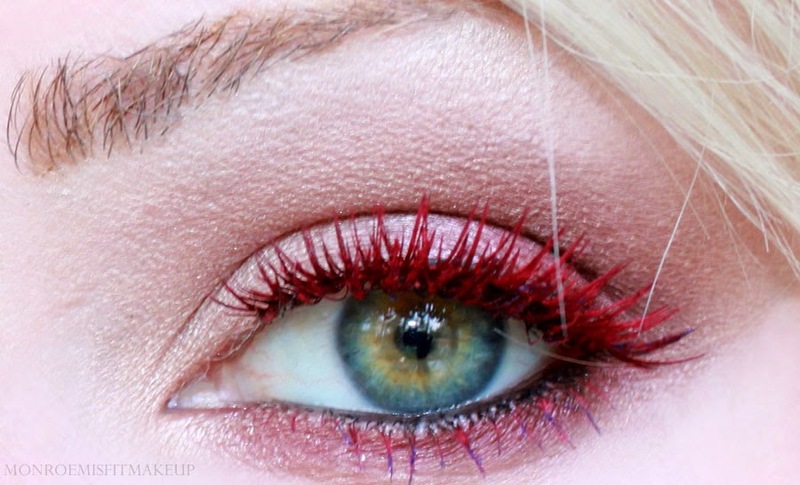 Instead of mascara, lashes were painted pink with MAC Pro Chromaline in Process Magenta. To make it slightly more "wearable" than the pink, I created my own Oxblood Mascara by painting my lashes with MAC Flammable Paint over Physicians Formula Hazel Mascara . If you want to invest in an actual burgundy mascara Yves Saint Laurent Luxurious Mascara # 05 Burgundy is a fine choice. I have yet to try the Rouge Bunny Rouge line, but the Dramatic Lash Mascara in Oxblood Panache looks very nice as well. The rest of the makeup was done using the balm Jovi Rockstar Face Palette. It does amplify eye color so it's not a total fail I guess? Worn lightly or over black this would give a subtle color boost to blue and green eyes. Still...Pink Eye is a Spring Trend I'll be skipping this season!